x1. Blackburn DL (2004) In Proceedings of the Semiconductor Thermal Measurement and Management Symposium, Twentieth Annual, IEEE, San Jose, CA, USA, 70: 9-11.
x2. Young DT, Chapman L, Muller CL, Cai XM, Grimmond CSB (2014) A Low-Cost Wireless Temperature Sensor: Evaluation for Use in Environmental Monitoring Applications. J Atmos Ocean Technol 31: 938.
x3. Kumar V, Bergman AA, Gorokhovsky AA, Zaitsev AM, Carbon (2011) Formation of carbon nanofilms on diamond for all-carbon based temperature and chemical sensor application. Carbon 49: 1385-94.
x4. Chen WP, Zhao ZG, Liu XW, Zhang ZX, Suo CG (2009) A Capacitive Humidity Sensor Based on Multi-Wall Carbon Nanotubes (MWCNTs). Sensors 9: 7431-44.
x5. Eda G, Fanchini G, Chhowalla M (2008) Large-area ultrathin films of reduced graphene oxide as a transparent and flexible electronic material. Nat. Nanotechnol 3: 270-4.
x6. Khurana G, Kumar N, Kotnala RK, Nautiyal T, Katiyar RS (2013) Temperature tuned defect induced magnetism in reduced graphene oxide. Nanoscale 5: 3346-51.
x7. Khurana G, Misra P, Kumar N, Katiyar RS (2014) Tunable Power Switching in Nonvolatile Flexible Memory Devices Based on Graphene Oxide Embedded with ZnO Nanorods. J Phys Chem 118: 21357-64.
x8. Novoselov KS, Geim AK, Morozov SV, Jiang D, Zhang Y, et al. (2004) Electric field effect in atomically thin carbon films. Science 306: 666-9.
x9. Chung MG, Kim DH, Lee HM, Kim T, Choi HH, et al. (2012) Highly sensitive NO2 gas sensor based on ozone treated grapheneSens. Sens Actuators B Chem 166-167: 172-6.
x10. Dan YP, Lu Y, Kybert NJ, Luo ZT, Johnson ATC (2009) Intrinsic response of graphene vapor sensors. Nano Lett, 9: 1472-5.
x11. Yoon HJ, Jun DH, Yang JH, Zhou ZX, Yang SS, et al. (2011) Carbon dioxide gas sensor using a graphene sheet. Sens Actuators B Chem 157: 310-13.
x12. Fazel FY, Koratkar N (2012) Graphene-Based Chemical Sensors. J Phys Chem Lett 3: 1746-53.
x13. Sahatiya P, Puttapati SK, Srikanth VVSS, Badhulika S (2016) Graphene-based wearable temperature sensor and infrared photodetector on a flexible polyimide substrate. Flex.Print. Electron 1: 025006.
x14. Sadasivuni KK, Kafy A, Kim HC, Ko H, Mun SC, et al. (2015) Reduced graphene oxide filled cellulose films for flexible temperature sensor application. Synth Met 206: 154-61.
x15. Bendi R, Bhavanasi V, Parida K, Nguyen VC, Sumboja A, et al. (2016) Self-powered graphene thermistor. Nano En 26: 586-94.
x16. Khurana G, Misra P, Katiyar RS (2013) Forming free resistive switching in graphene oxide thin film for thermally stable nonvolatile memory applications. J Appl Phys 114: 124508.
x17. Buchsteiner A, Lerf A, Pieper J (2006) Water dynamics in graphite oxide investigated with neutron scattering. J Phys Chem B 110: 22328-38.
x18. Jung I, Dikin DA, Piner RD, Ruoff RS (2008) Tunable electrical conductivity of individual graphene oxide sheets reduced at “low” temperatures. Nano Lett 8: 4283-7.
x19. Bartolomeo AD, Sarno M, Giubileo F, Altavilla C, Iemmo L (2009) Multiwalled carbon nanotube films as small-sized temperature sensors. J Appl Phys 105: 064518.
x20. Shao Q, Liu G, Teweldebrhan D, Balandinm AA (2008) High-temperature quenching of electrical resistance in graphene interconnects. Appl Phys Lett 92: 202108.
x21. Cheianov VV, Falko VI (2006) Friedel oscillations, impurity scattering, and temperature dependence of resistivity in graphene. Phys Rev Lett 97: 226801. 5. Eda G, Fanchini G, Chhowalla M (2008) Large-area ultrathin films of reduced graphene oxide as a transparent and flexible electronic material. Nat. Nanotechnol 3: 270-4. 6. Khurana G, Kumar N, Kotnala RK, Nautiyal T, Katiyar RS (2013) Temperature tuned defect induced magnetism in reduced graphene oxide. Nanoscale 5: 3346-51. 7. Khurana G, Misra P, Kumar N, Katiyar RS (2014) Tunable Power Switching in Nonvolatile Flexible Memory Devices Based on Graphene Oxide Embedded with ZnO Nanorods. J Phys Chem 118: 21357-64. 10. Dan YP, Lu Y, Kybert NJ, Luo ZT, Johnson ATC (2009) Intrinsic response of graphene vapor sensors. Nano Lett, 9: 1472-5. 11. Yoon HJ, Jun DH, Yang JH, Zhou ZX, Yang SS, et al. (2011) Carbon dioxide gas sensor using a graphene sheet. Sens Actuators B Chem 157: 310-13. 12. Fazel FY, Koratkar N (2012) Graphene-Based Chemical Sensors. J Phys Chem Lett 3: 1746-53. Copyright: © 2018 Katiyar RS. This is an open-access article distributed under the terms of the Creative Commons Attribution License, which permits unrestricted use, distribution, and reproduction in any medium, provided the original author and source are credited. In this study we demonstrated an efficient way to fabricate a reduced graphene oxide (rGO) temperature sensor and studied its sensing properties. The sensor device was fabricated by drop casting of the GO solution directly onto platinum inter-digital electrodes (Pt-IDE) and then reduced to rGO by low-temperature annealing and hydrazine vapor treatment. X-Ray diffraction and Raman spectroscopy were used to characterize the structural properties of the device. The temperature sensing properties of rGO were measured from 100-400 K and found that the resistance decreases exponentially with increasing temperature. The conductance of rGO sensor was following exactly the behavior of a standard temperature controller. The high sensitivity, stability and repeatability of the rGO sensor observed, are favorable for its temperature sensing applications. Portable, reliable, low-cost, low-power temperature sensors play an important role in many current and future temperature measurement applications, including those in the industry, agriculture and environmental fields [1,2]. So far, many efforts have been made to develop high performance temperature sensors using carbon-based materials including nanotubes, but all have their own advantages and specific working conditions [3,4]. Graphene-based complexes received significant attention for various applications ranging from optoelectronic to energy storage to memory devices [5-7]. Recently, graphene oxide (GO) based compounds have aroused tremendous interest for various sensing applications, mainly due to their large specific surface area for molecular adsorption and outstanding electrical properties, such as low noise level and high carrier mobility [8,9]. Yet, the application of GO based electronic sensors is still in its infancy, but their promising performances are remarkable [10-12]. However, the electrical insulating nature of conventional GO due to the presence of various functional groups makes it unfit to use as a conductance-based sensor, whereas reduced graphene oxide (rGO) restores the conductivity by removal of these functional groups and makes it suitable for these type of sensing applications. Being atomically thin and having a high surface-to-volume ratio, its surface can absorb gas molecules very efficiently. Although there are many reports on the gas sensing properties of GO, its temperature sensing properties have not been explored much. A recent report has shown the infrared photodetector and wearable temperature sensor in the temperature range of 35-45 °C utilizing reduced graphene oxide and graphene flakes . Another study shows the utilization of cellulose/rGO based composite films as a temperature sensor in the temperature range of 25-80 °C . Also, there is report highlighting the use of CVD grown graphene monolayer as thermistor by utilizing the polarization charge from ferroelectric polymer beneath . Although at present there are number of conventional and commercial devices for temperature sensing, but rGO based temperature sensor described in this study has the advantage of low cost, facile, sensitive and have wide working temperature range. Furthermore, the rGO based temperature sensor were fabricated by simple drop cast method on inter-digital electrodes (IDE). As, IDE’s are pervasive devices in modem electronics made up of two individually addressable inter-digitated comb-like electrode structures. These are one of the most popular transducers, widely employed in various technological and analytical applications, especially in the field of sensors due to their low cost, and excellent sensitivity. In the present study, we have fabricated reduced graphene oxide based temperature sensor using inter-digital electrodes (IDE’s) by a facile method of drop casting and the sensor performed very well in a wide temperature range of 100-400K. Graphene oxide (GO) synthesis was performed using a modified Hummers method as described in our earlier study . The sensor device was fabricated by drop casting of the GO solution directly on the platinum interdigital electrodes (Pt-IDE). After drying it was kept at 400 °C for 5 minutes followed by hydrazine vapor. The resistance of the GO before annealing was a few mega-ohms and decreased to several ohms after reduction due to the removal of oxygen functional groups, which decreases the distance between carbon atoms and facilitates charge transport via variable range hopping. Since the resistance of rGO sheets was found to be > 200 Ohms, we have employed a two-probe method to study the sensor characteristics. The structural characterization was carried out using XRD and Raman. The morphological characterization was carried out using FESEM. The temperature sensing properties of rGO were measured using MMR temperature controller and Keithley 2401. Figure 1a shows the XRD patterns of GO and rGO samples. The as-synthesized GO sample shows a major diffraction peak (002) at 10.2°, which is due to the introduction of oxygen functional groups on the graphite sheets as well as water molecules held in the interlayer galleries of hydrophilic GO . 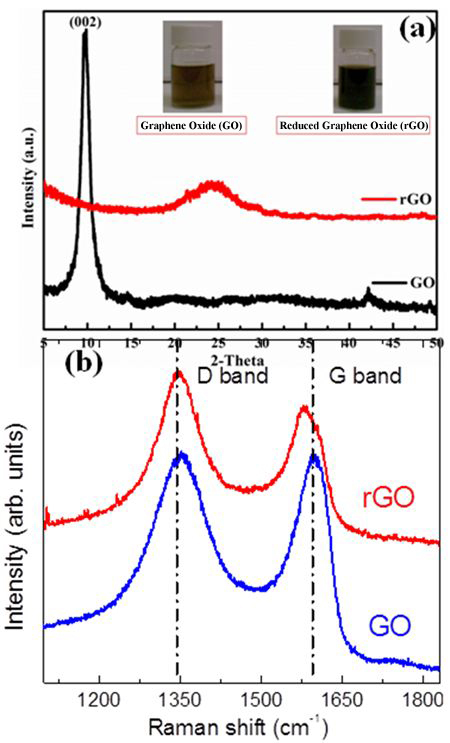 For rGO, an obvious shift in the (002) peak was observed, which can be ascribed to the reduction of GO and the disordered stacking of rGO due to the removal of oxygen functional groups and water molecules. Inset shows the photograph of graphene oxide (brown) and reduced graphene oxide (black) solutions. Figure 1b compares the Raman spectra of GO and rGO samples and both shows two distinct peaks at 1350 and 1580 cm-1, which are the so-called D and G Raman bands, respectively. The peak height of D and G bands are almost same in GO. However, the D band intensity is larger than that of G band in rGO, and this is due to the formation of large number of defects during the reduction process and consistent with the earlier reports . Figure 2a shows the FESEM image of the Pt-IDE on which a few layers of GO was deposited. Each of the Pt-IDE electrodes is 1000x20 μm length/width. The spacing between the consecutive electrode fingers is about 20 μm. FESEM images in Figure 2b,Figure 2c and Figure 2d show that the rGO film is transparent and consist of few layers. Where R is the resistance of the sample, and dR/dT is the slope. From this linear fit, dR/dT is found to be -2.9 Ohm/K, and hence the TCR is – 3.8×10-3 K-1. Interestingly, this TCR value is very close to that reported for single layer graphene resistor (= -1.47×10-3 K-1), but slightly smaller than the TCR value of a bilayer graphene resistor . Although we don’t have direct evidence of number of graphene layers in our device, this result suggests that single and bi-layers of graphene might be distributed non-uniformly on the Pt-IDE. A study on negative TCR in graphene was predicted earlier by Cheianov and Falkoo which states that the negative TCR is associated to the presence of structural defects and structural disorder etc . However, unlike pure graphene, the negative TCR in our rGO sensor may be intrinsic in origin as it has many activated sites present after chemical and subsequent thermal treatment. It is known that the epoxy and hydroxyl groups can be removed from the surface of GO under thermal treatment and leave behind structural defects in graphene. This can be confirmed from the Raman spectra of rGO (Figure 1b), where the intensity of the defect related D peak is larger compared to the G peak intensity. This experiment was performed several times and over long periods of times to ensure repeatability of the result. The sensitivity of the sensor is calculated by taking the first derivative of the R-T curve and is shown in Figure 3. It shows that while the sensitivity increases very slowly and linearly with lowering temperature, it increases rapidly below 150 K. Hence, fast response of the sensor can be achieved below 150 K. An ideal temperature sensor should have stable R(T), repeatability, fast response, high sensitivity, etc. To ensure the repeatability of our sensor, we have cooled and warmed the sample several times for different temperatures and compare our results with the MMR temperature controller in (Figure 4a and Figure 4b). It was found that the conductance of the rGO sensor followed the behavior of MMR K-20 controller in the complete temperature range. During measurements we intentionally increased/decreased the temperature of MMR controller and found that our sensor followed exactly the same way. To check the stability of our sensor, we maintain the temperature of sensor for a long time at 275 K and 300 K and cool and warm the sensor in this temperature range shown in Figure 4c. It was found that our sensor follows exactly same behavior as that of a standard temperature controller. In summary, the temperature sensing properties of rGO based sensor have been studied. Resistance of the rGO sensor increased exponentially with lowering temperature, which is similar to that of a standard thermistor. The linearity in resistance as a function of temperature was found and the TCR was 3.8 x10-3 Ohm/K. The conductance of rGO sensor follows exactly the behavior of a standard temperature controller. The sensing properties were found to be excellent for cooling and warming cycles at different temperatures, establishing it as a potential candidate for temperature sensing applications. The research was supported by the DOD Grant AFOSR-FA9550-16-1-0295.